Plain and Laminated elastomeric bearings: Bearings for construction industry in neoprene and natural rubber compound. 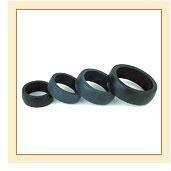 Laminated rubber bearings provide the simplest method of isolation and are most suitable for high frequency ground motions. High Damping Rubber Bearing (HDRB): This is ideal for seismic isolation. They are vertically stiff, capable of supporting vertical gravity loads, while being laterally flexible, capable of allowing large horizontal displacements. In effect, during an earthquake, the ground is allowed to move back and forth under a base isolated, while leaving the building to remain "stationary." These HDRB bearings are flexible and have energy absorption capability. The rubber bearings isolation system partly reflects and partly absorbs some of the earthquake input energy. Significant reductions of structural and non-structural damage can also be attained through the use of HDRB rubber bearings seismic isolation. Low Damping rubber bearing: In the isolation system, the different types of rubber bearings are designed and used along with dampers. The system that is popularly adopted for buildings is the elastomeric or rubber bearings with low damping. These rubber bearings are widely acceptable because of their longevity, economy and better control on dynamic properties. Lead Rubber Bearings (LRB): A lead rubber bearing is a much larger laminated bearing manufactured from layers of rubber which are sandwiched together with layers of steel and in the middle of the bearing there will be a solid lead "plug." Top and bottom of the LRB is fitted with steel plates, which are used to attach bearing to building through its foundation. Lead rubber bearings are designed in a way that the bearing is stiff and strong in vertical direction and flexible in horizontal direction. Lead, inserted as center of LRB dissipates the energy of earthquake and the rubber, reinforced with steel plates helps in providing stability, supports structure and isolates vibrations.